Can You Taste the Color of a Mug? Almost everyone likes to start their day with a hot cup of coffee in their favorite mug. But what plays into choosing a favorite? Maybe it's the shape, or the size. Or, perhaps the color of your mug also plays a part in how much you enjoy your daily cup of liquid motivation. In an Australian study, researchers investigated whether the color of a mug would influence the taste of the contents. Because our life is handcrafting custom stoneware mugs that are available in every color of the rainbow and then some — over 60 colors — we decided to conduct an experiment with our office staff. We divided the team into two groups. The Coffee Group was served the exact same flavor of coffee in mugs from the four glaze color families of sandstone, mulberry, blue and black. Those in the Cocoa Group were each served the same hot chocolate in mugs of green, orange, brown and oatmeal. While some members of our coffee team determined they tasted no difference in the contents of their mugs, others stated the coffee in the sandstone-based mugs was sweeter and lighter. The mulberry-based mugs contents were stronger and the brew in the blue mugs was smoother. Our cocoa group thought the green mugs contained extra chocolate, while the brown mugs contained dark chocolate. The orange mug contents were light and had a hint of cinnamon, and the group almost unanimously determined the hot chocolate in the oatmeal-based mugs was creamy, sweet, light and frothy. The color of a mug may, in fact, be an influencing factor in the overall experience of savoring that first cup in the morning, or that cocoa you have on a cool night. 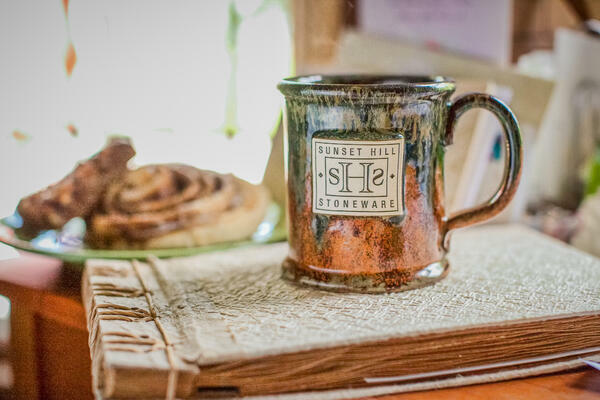 The next time you find yourself deciding on mug colors, perhaps it will help to ask what you want your customers to experience while drinking from your custom handcrafted coffee mugs. Since the Australian study determined plain white mugs made their contents seem bitter, that’s one less worry when choosing from our prismatic glaze color collection. To get a glimpse of our most popular styles to influence the flavor of your coffee or cocoa, download our free glaze suggestion guide from the link below.